The ADO.NET libraries can be used in two conceptually unique manners: connected or disconnected. When you are making use of the connected layer, your code base will explicitly connect to and disconnect from the underlying data store. 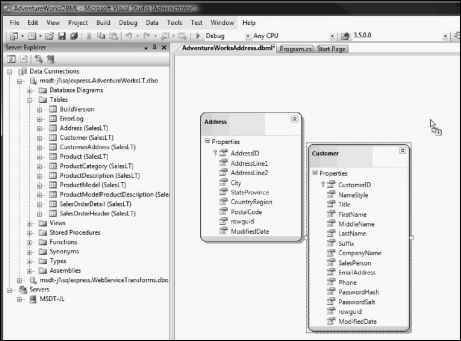 When you are using ADO.NET in this manner, you typically interact with the data store using connection objects, command objects, and data reader objects. The disconnected layer, which is the subject of Chapter 23, allows you to manipulate a set of DataTable objects (contained within a DataSet) that functions as a client-side copy of the external data. When you obtain a DataSet using a related data adapter object, the connection is automatically opened and closed on your behalf. As you would guess, this approach helps quickly free up connections for other callers and goes a long way toward increasing the scalability of your systems. Once a caller receives a DataSet, it is able to traverse and manipulate the contents without incurring the cost of network traffic. As well, if the caller wishes to submit the changes back to the data store, the data adapter (in conjunction with a set of SQL statements) is used once again to update the data source, at which point the connection is closed immediately. What are the two faces of ADO.NET? What are the faces of ADO.net and explain?